My first experience with Cargo Cosmetics eyeshadows. I was thrilled when one of my favourite online shopping destinations, HQHair, gave out the Cargo Cosmetics Let's Meet in Paris eyeshadow palette as a gift with purchase with orders of £50 and above. I bought a Micro-Pedi for my Mum and a NARS foundation for myself to get the Cargo palette. The palette they sent out, Let's Meet in Paris, is definitely Winter-friendly and belongs to the Holiday releases, but that doesn't stop me from loving it. These things are perennial; there are no rules or laws. If they are still available for sale and companies are sending them out to people, then we can drool all over them. Or not, as the case may be. Check out my swatches of the Cargo Cosmetics Let's Meet in Paris eyeshadow palette. Beautiful! Cloth-covered and looking very luxurious, the lid (magnetic) is made of cardboard (edges) and plastic while the body is made entirely of plastic - the latter makes any fallout easy to clean. I don't know who chose the design for the baroque cloth covering, but it is so Renaissance! The palette is very sturdy and has survived travel through the post and being dropped twice (not by the mailman). The palette opens up to reveal a mirror, 12 eyeshadows and a double-ended brush. The brush is an improvement on those sponge applicators that brands see fit to include in palettes, but falls short when compared to the brushes in the UD palettes. There's a shading end and an angled liner end. Okay, these are not all silky. The texture does feel a bit dry and rough when you run a fingertip over some of the pans. Dense, yes. But they don't feel gritty when you pack the colour on the eyelids. A couple of shadows fall under the cliched buttery-silky description. Some shades have fallout. I would compare these to Sleek eyeshadows, fallout-wise. Pigmentation is far superior! See for yourself further below. These need proper makeup remover to get them off. They are waterproof and immune to micellar water (proven further below) unless you are prepared to scrub. That's the take on staying power. I have not had creasing, though I do wish Cargo would do some nice mattes. Not a huuuge fan of glitter here. All shades are named after French landmarks, cuisine, icons or phrases. All shades but two - three, since one is a duochrome - are neutral-ish, with plenty of smoky eye options. Macaron: Shimmery pale gold. You've seen this shade in pretty much every neutral palette. Eiffel Tower: I had expected this to be silver or grey-black; instead it is absolutely dusty golden with a metallic finish. Creme Brulee: The shimmery golden copper that is a staple in most neutral palettes. Bonjour: Glittery blackish brown with olive undertones. Fallout alert. Cafe: A name like that is obviously cocoa-hued. 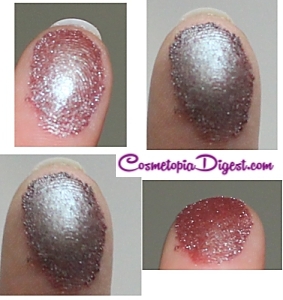 There is sparse glitter that barely shows up while swatching. There is fallout. Baguette: Ivory-beige with pink tones. Pearly finish. Softest in the palette. Croissant: My favourite of the lot! This is a duochrome! Multichrome, if you like. It comes off as taupe on the finger and moves on to a ruddy hue in the sun and looks more pink in the shade - you will see in swatches further below. Silvery-grey taupe and brick-red. Magnificent! This shadow was an absolute breeze to apply and felt downright creamy. Versailles: I expected this to be a rich, deep green, but it is a very grey, almost blackish, green. Ah well. There is fallout. Madame: Ooh, nice. An eggplant purple. The glitter barely shows up in swatches. Bastille: I would have loved to see more references to the French Revolution, and I associate the word "Bastille" with the shade red (Charles Darnay, Sidney-I-love-him-Carton and all that). Instead, this is a deep gunpowder grey. There is fallout. Beret: Deep brownish-black. Chalet School fans, this is the colour of the early uniform on some of the Armada covers of the Austrian days. Incidentally, it matches Jo's beret from the covers perfectly! There is fallout. The shimmer barely shows up. On bare skin, DRY, in natural light. Sorry about the weird tape marks. Now, just to give you an idea of how durable these are, I used Bioderma on the shadows, thereby wasting about half an ounce. Look! Photo indoors, artificial light. That is some serious pigmentation! I love Croissant, Eiffel Tower and Madame; they're among my all-time favourite shadows. Just take a look at finger swatches of Croissant alone on the left. Can you believe that is the same shade? This palette may not be a new release; some of the shadows are dupeable, and there is plenty of scope for smoky eye makeup looks here, but that pigmentation and some of those shades make it all worth it. As also the gorgeous packaging. Now that theBalm's formula has changed a bit, I'm glad to discover an amazing eyeshadow formula from another brand. I can't wait to pick up more palettes from Cargo - I've been eyeing one called Shanghai Nights. If Cargo keeps up with this pigmentation and colour shifts and has more frequent palette launches, I have a feeling a few brands would get a nice run for their money. You can pick up this palette here on Amazon or here from Debenhams, or here from FragranceDirect or from BeautyBay, LookFantastic or HQHair. Or just hit the widget below; there's a nice deal to be had, featuring more goodies.